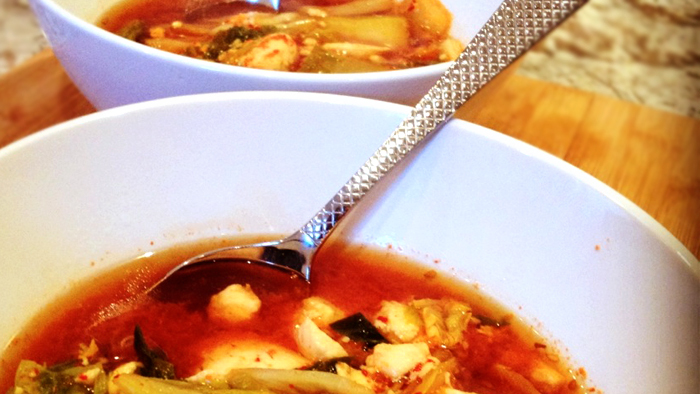 Called “Kimchi Jjigae” in Korean, this spicy kimchi and tofu “comfort food” is one of my favorite winter soups. It’s a great combination of flavors and textures that I crave year-round, but definitely when the temperature dips. This deep red and pungent classic is a Korean restaurant favorite, brought out in bubbling hot clay pots with eggs cracked right into the broth and cooking while it sits at the table. Vegetarian and gluten-free, this also happens to be one of the best low-carb, high-protein soups which will keep you feeling full for a long time while you’re watching your weight during the off-season. Your belly will welcome the addition of fermented kimchi and some sour notes to mix up the routine, and you’ll enjoy the digestive benefits of adding the probiotic “good bacteria” into your diet. 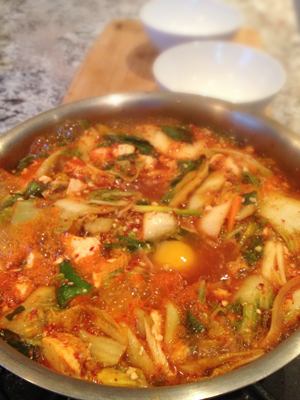 Kimchi has been known for years as one of the world’s best health foods. You can get great quality kimchi at any Asian market, and most natural markets now offer it as well. There are many different types, with various vegetables and levels of spiciness, so make sure to experiment and find the right balance that works for you. For this recipe we’ll keep it vegetarian and a medium spice level with soft custardy tofu and an egg cracked in. Yields approximately 4 servings of 2 cups each. Mix kimchi and vinegar together, then add to Stock and tofu. Add in any other chopped vegetables, soy sauce or chili sauce you have at this point, and bring to a low rolling boil. Adjust salt to taste, then crack in eggs if you’d like. Let them cook until the whites set.